All of us must have encountered this problem many times in our lives (atleast once! ); you know what I am talking about? Dropping our mobile phones, smart phones, tablets, camcorders, digital cameras, pen drives! In this era of gadgets we depend on a lot of portable devices to make our life more entertaining – we use smart phones to keep us online and connected 24 by 7, we use camcorders to capture beautiful moments of our life, tablet pcs to make mobile computing possible – well we use a lot of them. And all these devices costs us a fortune! Just think about it – all the portable devices we use might be worth thousands of dollars. What if we drop them accidentally at any point of time? We will loose the money! Take a look at the pictorial representation of air bag protection system proposed by Amazon CEO and his Vice President Greg Hart. This technology uses a gyroscope, camera, IR sensors and other sensors to detect various motions, orientation etc to understand if the motion is really an accidental drop or not! Proposed technology also calculates distance from other objects to determine in a split of second if its an “accident” or the device is at risk. Take a look at figure 2B:- Idea behind is to embed one or many small air bags inside the phone. When the phone drops or when an accident occurs, sensors will push the air bags out.An embeddedÂ cartridgeÂ ofÂ inflatedÂ air or carbon dioxide will be used to serve this purpose. Technology to determine which side of the phone will get hit is also proposed with the patent. If not, air bag will be pushed to cover the phone as a whole. 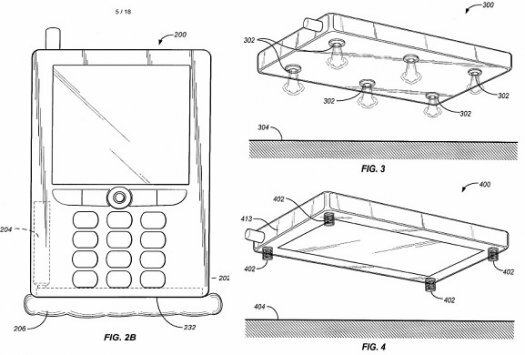 The patent also proposes the idea of reorienting the phone in air (by expelling gas) so that the side where air bag inflates will get hit on the floor. Bezos and his partner proposes another idea in figure 4 where springs will be deployed instead of air bags. In figure 3, Bezos and his colleague imagines a “propulsion system” by expelling gases to make possible a “safe/gentle” landing of the portable device. Well to your surprise Bezos filed this patent way back in February 2010, but Geekwire just publicized it by introspecting US patent files. Patents may or may not get into reality! Its all about ideas and innovation. But if its likely to get implemented, we will see this in upcoming Amazon Kindle versions or the muchÂ rumoredÂ Amazon android tablets.